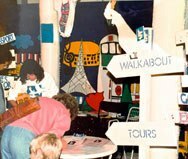 It all began in 1986 when we launched Walkabout at the Holiday & Adventure Travel Show at the old Melbourne Exhibition Buildings. We still remember it very clearly - we had reserved a booth where we had set up a display with our “sign post and cockatoo” and a picnic table. We remember feeling quite overwhelmed being surrounded by “big name “ tour operators. In the stand next to us was Tim Macartney-Snape who was promoting his tour company which ran adventure tours in the NSW High Country. Two years previously Tim had become the first Australian, together with Greg Mortimer, to climb Mount Everest. We have never forgotten how supportive Tim was when he introduced himself to us - it was very reassuring to have his encouragement on Walkabout’s very first day! The exhibition proved to be a great launching pad for Walkabout - it was a 3 day exhibition and each day when we returned home the first thing we did was to rush to our answering machine and check whether any potential customers had left us a message. Before the exhibition we had printed a small one colour brochure with our proposed walks for the following year - our 1st planned walk was to Fraser National Park at Lake Eilden in Victoria. On the Sunday night when we returned home from the final day of the exhibition the red light was flashing on the answering machine and there was a message from Jeanie and Allan Todd who wanted to book our 1st tour together with their friends Margaret and Ken McArthur (Margaret has very kindly written an article about their association with Walkabout later) - Walkabout was off and running! 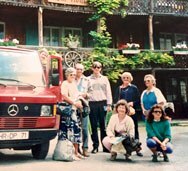 Many of our guests often ask us where we got the idea in the first place - it all began really in Germany in1984 when we were living there and we had decided to move back to Australia. 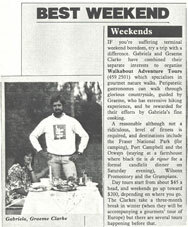 Initially we had come up with concept of organising “Surfing Safaris” - we had even printed a brochure in Germany and had our route and beaches organised between Melbourne and Sydney - later we came to realise that it was difficult enough promoting the concept of Walking Tours so selling Surfing tours would have been a very big “ask”! The Walking Tours concept came about one evening when we were showing European friends slides of Wilson's Promontory National Park and when they asked how they could get there we realised that it was impossible for overseas guests to access most of the National Parks in Australia so we realised there was an opportunity. Little did we know that it was going to be the Australians themselves who wanted to join us on our Aus tours and of course later convince us that we should show them the nicest places to walk in Europe. 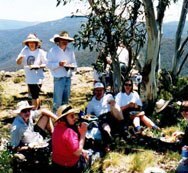 On our Aus walks we were preparing all the food as well as conducting the walks. 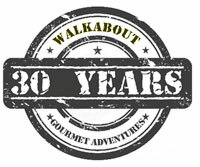 As we mentioned we began as Walkabout Adventure Tours but after a few years our guests suggested that we had to emphasise the “food” side of our tours so we changed our name to Walkabout Gourmet Adventures. First press cut in 1987!